One of our fleet specialist will reach out to you to verify any and all additional savings you may qualify for. This does require to answer additional questions. Please notate if you prefer to talk over the phone or email. 1500 Big Horn Bright Silver Clearcoat Metallic CARFAX One-Owner. Clean CARFAX. 4X4, Back Up Camera, Heated Seats, Multi-Zone Climate Control, Tow Package, Remote Start, Bluetooth/Hands-Free, USB Port/Phone Charger, Auxilliary Jack, 115V Auxiliary Power Outlet, 40/20/40 Split Bench Seat, 6 Month Trial (Reg. Required), 6 Month Trial (Registration Required), 8.4" Touchscreen Display, Air Conditioning ATC w/Dual Zone Control, Audio Jack Input for Mobile Devices, Auto-Dimming Exterior Mirrors, Auto-Dimming Rear-View Mirror, Big Horn Badge, Big Horn Regional Package, Bright/Bright Billets Grille, Charge Only Remote USB Port, Class IV Receiver Hitch, Electric Shift-On-Demand Transfer Case, Electroluminescent Instrument Cluster, Exterior Mirrors Courtesy Lamps, Exterior Mirrors w/Supplemental Signals, Fog Lamps, Folding Flat Load Floor Storage, For Details Visit DriveUconnect.com, Front Armrest w/3 Cupholders, Front Center Seat Cushion Storage, Glove Box Lamp, GPS Antenna Input, Integrated Voice Command w/Bluetooth, Leather Wrapped Steering Wheel, LED Bed Lighting, Media Hub (USB, AUX), Nav-Capable! See Dealer for Details, Overhead Console w/Garage Dr Opener, ParkSense Front/Rear Park Assist System, ParkView Rear Back-Up Camera, Power 10-Way Driver Seat, Power Heated Fold-Away Mirrors, Power Lumbar Adjust, Power-Folding Mirrors, Premium Cloth 40/20/40 Bench Seat, Quick Order Package 22S Big Horn, Radio: Uconnect 3C w/8.4" Display, Rear 60/40 Split Folding Seat, Rear Dome w/On/Off Switch Lamp, Remote Start System, Remote USB Port, Security Alarm, SIRIUSXM Satellite Radio, Steering Wheel Mounted Audio Controls, Storage Tray, Sun Visors w/Illuminated Vanity Mirrors, Uconnect Access, Underhood Lamp, Universal Garage Door Opener, Wheels: 20" x 8" Aluminum Chrome Clad. Priced below KBB Fair Purchase Price! Please Note: The included equipment is based on the dealership's bookout process and manufacturer's default configuration for this particular vehicle's type (year/make/model/style) which may vary slightly from the actual vehicle in stock. See salesperson to verify accuracy prior to purchase. 1500 Big Horn 1500 Big Horn, 4WD, 115V Auxiliary Power Outlet, 40/20/40 Split Bench Seat, 6 Month Trial (Reg. Required), 6 Month Trial (Registration Required), 8.4" Touchscreen Display, Air Conditioning ATC w/Dual Zone Control, Ash Tray Lamp, Auto-Dimming Exterior Mirrors, Big Horn Badge, Big Horn Regional Package, Bright/Bright Billets Grille, Charge Only Remote USB Port, Class IV Receiver Hitch, Electric Shift-On-Demand Transfer Case, Electroluminescent Instrument Cluster, Exterior Mirrors Courtesy Lamps, Exterior Mirrors w/Supplemental Signals, Fog Lamps, Folding Flat Load Floor Storage, For Details Visit DriveUconnect.com, Front Armrest w/3 Cupholders, Front Center Seat Cushion Storage, Glove Box Lamp, GPS Antenna Input, Heated Front Seats, Heated Seats & Wheel Group, Heated Steering Wheel, Humidity Sensor, Integrated Voice Command w/Bluetooth, Leather Wrapped Steering Wheel, LED Bed Lighting, Media Hub (SD, USB, AUX), Nav-Capable! See Dealer for Details, Overhead Console w/Garage Dr Opener, ParkSense Front/Rear Park Assist System, ParkView Rear Back-Up Camera, Power 10-Way Driver Seat, Power Folding Mirrors, Power Heated Fold-Away Mirrors, Power Lumbar Adjust, Premium Cloth 40/20/40 Bench Seat, Quick Order Package 22S Big Horn, Radio: Uconnect 8.4, Rear 60/40 Split Folding Seat, Rear Dome w/On/Off Switch Lamp, Rear-View Auto-Dimming Mirror w/Microphone, Remote SD Card Slot, Remote Start System, Security Alarm, SIRIUSXM Satellite Radio, Steering Wheel Mounted Audio Controls, Storage Tray, Sun Visors w/Illuminated Vanity Mirrors, Uconnect Access, Underhood Lamp, Universal Garage Door Opener, Wheels: 20" x 8" Aluminum Chrome Clad. Priced below KBB Fair Purchase Price! Low mileage trades arriving every day! All credit applications accepted, come see the Bosak difference!! Recent Arrival! 1500 Outdoorsman Brilliant Black Crystal Pearlcoat CARFAX One-Owner. 1 Yr. Trial (Registration Required), 115V Auxiliary Power Outlet, 32 Gallon Fuel Tank, 4-Wheel Disc Brakes, 5-Year SIRIUSXM Traffic Service, 5-Year SIRIUSXM Travel Link Service, 6 Month Trial (Reg. Required), 6 Month Trial (Registration Required), 6 Speakers, 8.4" Touchscreen Display, ABS brakes, Accent Fender Flares, Active Grille Shutters, Air Conditioning, AM/FM radio, Anti-Spin Differential Rear Axle, Ash Tray Lamp, Audio Jack Input for Mobile Devices, Auto-Dimming Exterior Mirrors, Black Door Handles, Black Exterior Mirrors, Black Rotary Shifter, Black Tubular Side Steps w/AP1, Body Color Fender Flares, Body Color Grille, Brake assist, Bright Front & Rear Bumpers, Bucket Seats, Class IV Receiver Hitch, Compass, Dual front side impact airbags, Electroluminescent Instrument Cluster, Electronic Shift, Electronic Stability Control, Exterior Mirrors Courtesy Lamps, Exterior Mirrors w/Heating Element, Exterior Mirrors w/Supplemental Signals, Fog Lamps, Folding Flat Load Floor Storage, For Details Visit DriveUconnect.com, Front & Rear Rubber Floor Mats, Full Length Upgraded Floor Console, Glove Box Lamp, GPS Antenna Input, GPS Navigation, HD Radio, Heated door mirrors, Heated Steering Wheel, Illuminated entry, Integrated Voice Command w/Bluetooth, Leather Wrapped Steering Wheel, LED Bed Lighting, Low tire pressure warning, Luxury Group, Media Hub (SD, USB, AUX), Media Hub (USB, AUX), Monotone Outdoorsman, Nav-Capable! See Dealer for Details, Outdoorsman Badging, Outdoorsman Group, Overhead Console w/Garage Dr Opener, Passenger door bin, Power 10-Way Driver Seat, Power Folding Mirrors, Power Heated Fold-Away Mirrors, Power Lumbar Adjust, Power windows, Premium Cloth Bucket Seats, Protection Group, Quick Order Package 22T Outdoorsman, Radio: Uconnect 8.4, Radio: Uconnect 8.4 NAV, Rear 60/40 Split Folding Seat, Rear Dome w/On/Off Switch Lamp, Rear Extra HD Shock Absorbers, Rear step bumper, Rear-View Auto-Dimming Mirror w/Microphone, Remote SD Card Slot, Remote Start & Security Alarm Group, Remote Start System, Security Alarm, Semi-Gloss Black Hub, SIRIUSXM Satellite Radio, SIRIUSXM Traffic, SIRIUSXM Travel Link, Spray In Bedliner, Steering Wheel Mounted Audio Controls, Sun Visors w/Illuminated Vanity Mirrors, Tachometer, Tilt steering wheel, Tip Start, Tow Hooks, Traction control, Trip computer, Uconnect Access, Uconnect Access 1 Year Trial, Underhood Lamp, Universal Garage Door Opener, Voltmeter. Priced below KBB Fair Purchase Price! See this at www.bosakmotor.com. Recent Arrival! 1500 Big Horn Brilliant Black Crystal Pearlcoat CARFAX One-Owner. 4-Wheel Disc Brakes, 6 Month Trial (Reg. Required), 6 Month Trial (Registration Required), 6 Speakers, 8.4" Touchscreen Display, ABS brakes, Active Grille Shutters, Air Conditioning, Air Conditioning ATC w/Dual Zone Control, AM/FM radio, Audio Jack Input for Mobile Devices, Auto-Dimming Exterior Mirrors, Auto-Dimming Rear-View Mirror, Big Horn Badge, Big Horn Regional Package, Black Exterior Mirrors, Black Rotary Shifter, Brake assist, Bright/Bright Billets Grille, Bucket Seats, Bumpers: chrome, Class IV Receiver Hitch, Compass, Delay-off headlights, Driver door bin, Electric Shift-On-Demand Transfer Case, Electroluminescent Instrument Cluster, Electronic Shift, Electronic Stability Control, Exterior Mirrors Courtesy Lamps, Exterior Mirrors w/Heating Element, Exterior Mirrors w/Supplemental Signals, Fog Lamps, For Details Visit DriveUconnect.com, Front Center Armrest w/Storage, Full Length Upgraded Floor Console, Fully automatic headlights, Glove Box Lamp, GPS Antenna Input, Illuminated entry, Integrated Voice Command w/Bluetooth, Leather Wrapped Steering Wheel, LED Bed Lighting, Low tire pressure warning, Media Hub (USB, AUX), Nav-Capable! See Dealer for Details, Occupant sensing airbag, Outside temperature display, Overhead console, Overhead Console w/Garage Dr Opener, Panic alarm, ParkSense Front/Rear Park Assist System, ParkView Rear Back-Up Camera, Power door mirrors, Power Heated Fold-Away Mirrors, Power steering, Power windows, Power-Folding Mirrors, Premium Cloth Bucket Seats, Quick Order Package 22S Big Horn, Radio data system, Radio: Uconnect 3 w/5" Display, Radio: Uconnect 3C w/8.4" Display, Rear Dome w/On/Off Switch Lamp, Rear step bumper, Remote Start System, Remote USB Port, Security Alarm, SIRIUSXM Satellite Radio, Speed control, Steering Wheel Mounted Audio Controls, Sun Visors w/Illuminated Vanity Mirrors, Tachometer, Tilt steering wheel, Traction control, Trip computer, Uconnect Access, Underhood Lamp, Universal Garage Door Opener, Voltmeter, Wheels: 20" x 8" Aluminum Chrome Clad. Priced below KBB Fair Purchase Price! 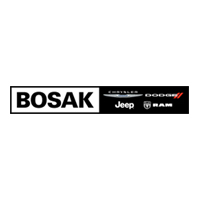 See this at www.bosakmotor.com. 1500 Big Horn Brilliant Black Crystal Pearlcoat CARFAX One-Owner. Clean CARFAX. 4X4, Back Up Camera, Heated Seats, Tow Package, Remote Start, Bluetooth/Hands-Free, USB Port/Phone Charger, Auxilliary Jack, 115V Auxiliary Power Outlet, 6 Month Trial (Reg. Required), 6 Month Trial (Registration Required), 8.4" Touchscreen Display, Air Conditioning ATC w/Dual Zone Control, Audio Jack Input for Mobile Devices, Auto-Dimming Exterior Mirrors, Auto-Dimming Rear-View Mirror, Big Horn Badge, Big Horn Regional Package, Bright/Bright Billets Grille, Bucket Seats, Charge Only Remote USB Port, Class IV Receiver Hitch, Electric Shift-On-Demand Transfer Case, Electroluminescent Instrument Cluster, Exterior Mirrors Courtesy Lamps, Exterior Mirrors w/Supplemental Signals, Fog Lamps, Folding Flat Load Floor Storage, For Details Visit DriveUconnect.com, Front Armrest w/3 Cupholders, Front Center Seat Cushion Storage, Glove Box Lamp, GPS Antenna Input, Integrated Voice Command w/Bluetooth, Leather Wrapped Steering Wheel, LED Bed Lighting, Media Hub (USB, AUX), Nav-Capable! See Dealer for Details, Overhead Console w/Garage Dr Opener, ParkSense Front/Rear Park Assist System, ParkView Rear Back-Up Camera, Power 10-Way Driver Seat, Power Heated Fold-Away Mirrors, Power Lumbar Adjust, Power-Folding Mirrors, Premium Cloth 40/20/40 Bench Seat, Quick Order Package 22S Big Horn, Radio: Uconnect 3C w/8.4" Display, Rear 60/40 Split Folding Seat, Rear Dome w/On/Off Switch Lamp, Remote Start System, Remote USB Port, Security Alarm, SIRIUSXM Satellite Radio, Steering Wheel Mounted Audio Controls, Storage Tray, Sun Visors w/Illuminated Vanity Mirrors, Uconnect Access, Underhood Lamp, Universal Garage Door Opener, Wheels: 20" x 8" Aluminum Chrome Clad. Priced below KBB Fair Purchase Price! Please Note: The included equipment is based on the dealership's bookout process and manufacturer's default configuration for this particular vehicle's type (year/make/model/style) which may vary slightly from the actual vehicle in stock. See salesperson to verify accuracy prior to purchase. Recent Arrival! 1500 Big Horn True Blue CARFAX One-Owner. Clean CARFAX. Priced below KBB Fair Purchase Price! Please Note: The included equipment is based on the dealership's bookout process and manufacturer's default configuration for this particular vehicle's type (year/make/model/style) which may vary slightly from the actual vehicle in stock. See salesperson to verify accuracy prior to purchase. 1500 Big Horn Bright White Clearcoat CARFAX One-Owner. 1 Yr. Trial (Registration Required), 4-Wheel Disc Brakes, 5-Year SIRIUSXM Traffic Service, 5-Year SIRIUSXM Travel Link Service, 6 Month Trial (Reg. Required), 6 Month Trial (Registration Required), 8.4" Touchscreen Display, 9 Alpine Speakers w/Subwoofer, ABS brakes, Active Grille Shutters, Air Conditioning, Air Conditioning ATC w/Dual Zone Control, Audio Jack Input for Mobile Devices, Auto-Dimming Exterior Mirrors, Auto-Dimming Rear-View Mirror, Big Horn Badge, Big Horn Regional Package, Black Rotary Shifter, Brake assist, Bright/Bright Billets Grille, Bucket Seats, Bumpers: chrome, Class IV Receiver Hitch, Compass, Delay-off headlights, Dual Rear Exhaust w/Bright Tips, Electric Shift-On-Demand Transfer Case, Electroluminescent Instrument Cluster, Exterior Mirrors Courtesy Lamps, Exterior Mirrors w/Heating Element, Exterior Mirrors w/Supplemental Signals, Fog Lamps, For Details Visit DriveUconnect.com, Front Center Armrest w/Storage, Fully automatic headlights, Glove Box Lamp, GPS Antenna Input, GPS Navigation, HD Radio, Illuminated entry, Integrated Voice Command w/Bluetooth, Leather Wrapped Steering Wheel, LED Bed Lighting, Media Hub (USB, AUX), Nav-Capable! See Dealer for Details, Occupant sensing airbag, Outside temperature display, Overhead Console w/Garage Dr Opener, Panic alarm, ParkSense Front/Rear Park Assist System, ParkView Rear Back-Up Camera, Power Heated Fold-Away Mirrors, Power steering, Power windows, Power-Folding Mirrors, Quick Order Package 26S Big Horn, Radio: Uconnect 3C Nav w/8.4" Display, Radio: Uconnect 3C w/8.4" Display, Rear Dome w/On/Off Switch Lamp, Rear step bumper, Remote keyless entry, Remote Start System, Remote USB Port, Security Alarm, SIRIUSXM Satellite Radio, SIRIUSXM Traffic, SIRIUSXM Travel Link, Speed control, Spray In Bedliner, Steering Wheel Mounted Audio Controls, Sun Visors w/Illuminated Vanity Mirrors, Tachometer, Tilt steering wheel, Tip Start, Traction control, Uconnect Access, Uconnect Access 1 Year Trial, Underhood Lamp, Universal Garage Door Opener, Wheel to Wheel Side Steps, Wheels: 20" x 8" Aluminum Chrome Clad. Priced below KBB Fair Purchase Price! See this at www.bosakmotor.com. 1500 Express Bright Silver Clearcoat Metallic Clean CARFAX. CARFAX One-Owner. 1-Year SiriusXM Radio Service, 3.21 Rear Axle Ratio, 40/20/40 Split Bench Seat, 4-Wheel Disc Brakes, 5.0" Touchscreen Display, 6 Speakers, ABS brakes, Air Conditioning, AM/FM radio, Anti-Spin Differential Rear Axle, Audio Jack Input for Mobile Devices, Black Exterior Mirrors, Body Color Front Fascia, Body Color Grille, Body Color Rear Bumper w/Step Pads, Brake assist, Carpet Floor Covering, Charge Only Remote USB Port, Cloth 40/20/40 Bench Seat, Delay-off headlights, Delete Class IV Receiver Hitch, Delete Spray In Bedliner, Dual Rear Exhaust w/Bright Tips, Electronic Stability Control, Express Value Package, Exterior Mirrors w/Heating Element, For More Info, Call 800-643-2112, Front Armrest w/3 Cupholders, Front Floor Mats, Front Fog Lamps, Fully automatic headlights, GPS Antenna Input, Heated door mirrors, Integrated Voice Command w/Bluetooth, Manual Adjust Seats, Media Hub (USB, AUX), No Satellite Coverage w/AK/HI/PR/VI/GU, Overhead Console, Passenger door bin, Power door mirrors, Power steering, Power windows, Quick Order Package 27J Express, Radio: Uconnect 3 w/5" Display, Ram 1500 Express, Rear Floor Mats, Rear Folding Seat, Rear step bumper, Rear View Day/Night Mirror, Remote Keyless Entry w/All-Secure, Remote USB Port, SiriusXM Satellite Radio, Speed control, Tachometer, Temperature & Compass Gauge, Tilt steering wheel, Traction control, Voltmeter. See this at www.bosakmotor.com. 1500 Laramie Maximum Steel Metallic Clearcoat CARFAX One-Owner. 1-YR SiriusXM Guardian Trial, 4-Wheel Disc Brakes, 6 Speakers, ABS brakes, Active Grille Shutters, Air Conditioning, AM/FM radio: SiriusXM, Apple CarPlay, Audio Jack Input for Mobile Devices, Audio memory, Automatic temperature control, Brake assist, Compass, Delay-off headlights, Driver door bin, Driver vanity mirror, Folding Flat Load Floor Storage, Front Center Armrest w/Storage, Fully automatic headlights, Garage door transmitter, Google Android Auto, GPS Antenna Input, HD Radio, Heated Front Seats, Heated steering wheel, Illuminated entry, Integrated Voice Command w/Bluetooth, Leather steering wheel, Low tire pressure warning, Memory seat, Outside temperature display, Panic alarm, Pedal memory, Power 10-Way Memory Driver & 6-Way Passenger Seats, Power passenger seat, Power steering, Power windows, Radio data system, Radio: Uconnect 4C w/8.4" Display, Rear 60/40 Split Folding Seat, Rear step bumper, Remote keyless entry, Remote USB Port, SiriusXM Satellite Radio, Speed control, Steering wheel mounted audio controls, Tachometer, Tilt steering wheel, Tip Start, Trip computer, Turn signal indicator mirrors, Ventilated Front Seats, Ventilated front seats, Voltmeter. Odometer is 636 miles below market average! See this at www.bosakmotor.com. New vehicle pricing includes all offers and incentives. Tax, Title and Tags not included in vehicle prices shown and must be paid by the purchaser. While great effort is made to ensure the accuracy of the information on this site, errors do occur so please verify information with a customer service rep. This is easily done by calling us at (219) 767-4821 or by visiting us at the dealership.